Over Christmas the boyfriend and I headed back to stay with his parents for a couple of days. One evening we decide to take a little trip to Asda just for something to do really. I decided to have a wander down the beauty aisles not expecting to find anything exciting but then a brand display caught my eye. Nspa Beauty Rituals is a budget home spa range which was launched by Nirvana Spa in March 2012. The range features a four step plan of cleanse, exfoliate, treat and moisturise with a couple of different products to chose from for each step. Then I spotted this gorgeous little beauty box. All four products in the box contain essential oil of neroli with each individual product then additionally containing either grapeseed oil, cocoa butter, sweet almond oil or maca root. You start by applying the Melting Cleansing Gel to dry skin using small circular motions. You then wet your fingers and carry on massaging to transform the gel to a milk before rinsing. The Hot Cloth Polish is then also applied to dry skin using small circular motions and then gently wiped away using the cloth which has been rinsed in warm water. The Illuminating Beauty Serum and Brightening Day Cream are then applied as normal. I have never visited a spa or had any kind of facial (I think getting a facial may need to be another resolution for this year) so I’m not sure what these products should feel like to use but I did really enjoy using them. All four products smelt lovely, particularly the Melting Cleansing Gel, and felt really nice to apply. I was slightly concerned that the Illuminating Beauty Serum contained glitter (I guess this is the illuminating part) but a quick check in the mirror revealed I wasn’t sparkling like a Twilight vampire! Overall, after using these products together my skin felt soft and moisturised and gave off a lovely light scent. A rough tot up of the products in the beauty box worked out at just under £18. With the box priced at £10 this was a pretty good saving however as the box was half price this was even better! 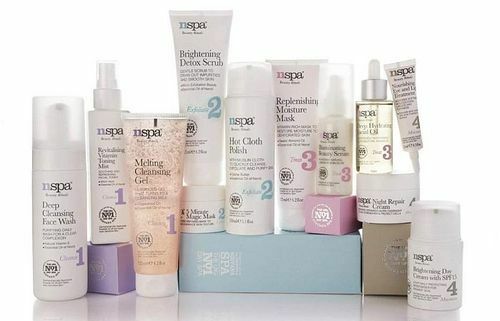 Nspa Beauty Rituals products are priced between £3 and £7 and can be purchased through the Nirvana Spa website http://www.nirvanaspa.co.uk/day-spa or exclusively at Asda stores.